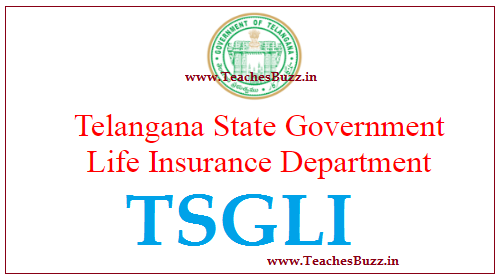 Telangana State Governament Life Insurance Scheme(TSGLI) Previously APGLI Andhra Pradesh Life Insurance Scheme in Combined State AP. After the formation of Telangana State on 02.06.2014 it has been renamed as TSGLI. Download the TSGLI PolicyBond, Employees can Know Your TSGLI Policy Details from the following details, Know your Policy Number by using Policy No. Search option, Know your TSGLI Policy Status using with Policy Status. 1. The Government employees who are between 21 and 53 years of age are eligible for taking TSGLI Policies. 2. The TSGLI Department issues only Endowment Policies which mature one day before attaining(58) years of age. 3. TSGLI policies do not lapse. 4. The Premium rates are low. 5. TSGLI Premium is exempted from income tax under section 80C. 7. The present rate of Bonus is Rs 100/- for every Rs 1000/- Sum Assured per annum. 8. The Loans are sanctioned up to 90% of Surrender Value. 9. Only Simple Interest of 9% per annum is charged against loans sanctioned. 10. In case of maturity of the policy, the total Sum Assured and Bonus till Date of Maturity are paid to the policy holder. 11.If the Policy Holder ceases to be Government servant, and decides to surrender the policy by discontinuing the payment of Premium, the subscriber will be paid the Surrender Value and the eligible Bonus. 12. In case of Death of policy holder before maturity of the policy, the full Sum Assured along with Bonus till date of death are paid to the legal heirs.